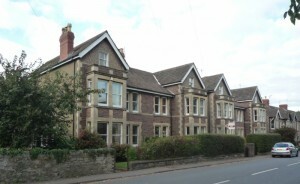 The above photograph was taken in 2009 showing the row of houses opposite the old Grammar School (now Castle School 6th Form Centre) in Thornbury. The house on the left is 13 Gloucester Road, one of the four houses built by Frank and George Tucker who operated under the name of Tucker Brothers. We think that the house was built in 1907. Click here to read about the row of houses. The house was given the name ‘Glenthorne’ and this name is inscribed on a lintel on the front of the house. We are not sure why the name was chosen. Glenthorne is the name of an estate located on the coast of Exmoor near Countisbury. It was built in a very isolated spot about 1840 by Rev. Walter Stevenson Halliday, a reclusive clergyman. We are not aware of any connection between that place and the Tucker brothers or the Burchell family who were the first family to live there. The photo below shows a family group in the garden of Glenthorne. 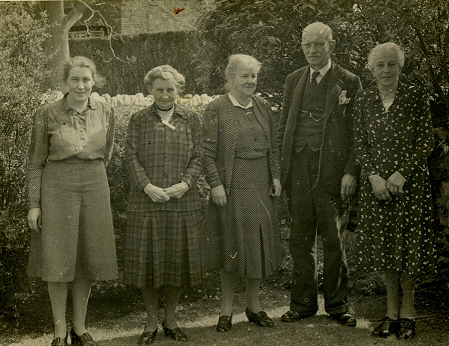 We understand that it shows (left to right): Maud Worsley, Leah Boulton (the wife of Lil’s brother, Ralph), Lil Burchell, Harry Burchell and an unidentified person. During the early years of the Burchell’s occupancy of the house they shared the house with other members of the Burchell/Boulton families. Helen Burchell Frederick’s brother was married from the house in January 1908 and the wedding reception was held there. The 1911 census shows Frederick’s brother, Robert John Burchell a market gardener aged 29 and Elizabeth’s brother, Harry Dawson Boulton, (described as ‘Assistant Clerk to Guardians and District Council’ aged 48) were also living at Glenthorne. Neither of these men married. Robert John Burchell was living there until 1931 except for the period during the First World War when he served in the Army. By 1935 he had moved to live in Eastlands. Harry Dawson Boulton was shown as being a lodger in Harry’s house in the 1913 electoral register and because all the later records show him as living in ‘Gloucester Road’ we assume that he continued living there until his death in 1925. The 1939 electoral register shows that Elizabeth Joyce Leighton was living with the Burchells. ‘Joyce’ as she was known was Harry and Lil’s grand-niece. She was born in 1917, the grand-daughter of Lil’s sister, Annie Ford by her daughter Annie who in 1915 had married a widowed schoolmaster, Frederick Leighton, possibly at Lydiard Tregoze in Wiltshire where he lived. Joyce’s mother had died in 1919 and her father in 1929. Joyce married Noel Cunnell in the Sittingborne area in 1944. After the war Joyce and Noel lived for some years in Glenthorne with the Burchells (see below). Maud Worsley – Maud Mary was the daughter of James Worsley and his wife, Hester who lived in Morton. She was born on 27th November 1892 and baptised on 5th February 1893. Maud started at the National School in April 1898. The admissions register for that school suggests that she had previously gone to the school at Rockhampton. She left the National School in 1906 to go into service. Maud was employed by the Burchells (see above). The 1911 census describes her as a domestic servant but as mentioned above one of her main roles was to look after Dorothy Burchell who was in poor health since her birth. When Dorothy died in 1916 aged 15 Maud stayed in the house and became a housekeeper and companion to Elizabeth Burchell. The group photo shown above shows Maud standing on the left in the garden of Glenthorne. We are grateful to our good friend Ken Worsley who told us a lot about Maud. He said that ‘she did not have a good education as such, but she read and listened to the radio. It was part of her job as companion to talk and listen so she took the chance to develop her education for herself. She became a very respected member of the local community. Maud was a founder member of Hill and Rockhampton WI and toured the country lecturing on glove making and promoting the WI. She made gloves out of skins of all types – moles rabbits and anything that moved. She paid the children for catching the animals. She knew a lot of things and not just about Thornbury. She also knew a lot about current events’. The Cunnels – for a few years after the Second World War the house seems to have been shared with Noel and Elizabeth Joyce Cunnell. When they baptised their daughter Elizabeth Noelle on 9th December 1951 they gave their address as Glenthorne. Noel was a Captain in H. M. Forces and the electoral registers from 1949 to 1954 list Noel and Elizabeth but indicate they were in the Services. Ernest & Josephine Lovatt – we are not sure how long the Lovatts lived in the house. They were listed as living there in the top flat in the 1965 electoral register, but had moved away by 1970. Ernest and Josephine had married in the Walsall area in 1961. Ernest was a representative. They had a son, Craig Paul Lovatt born on 17th October 1964 and baptised in St Mary’s Church in Thornbury on 21st February 1965. The Morse family – the 1970 electoral register shows the house was split into two flats. Justin C and Betty A Morse were living in the top flat and William and Florence G.M. Morse in the bottom flat. We know that Justin had married Betty A Monks in the Bristol area in 1972. The Hockings – from April 1971 the house was occupied by Hannibal W. D. and Eileen Hocking. We know that Hannibal was born in the Redruth area in 1930 and attended teacher training at King Alfred College, Winchester. He married Eileen Truran in the Redruth area in 1953. Hannibal was headmaster of Smannell and Enham Churches School near Andover before he took up the post of headmaster of St Mary’s School in Thornbury in April 1971. Hannibal and Eileen were listed as living in the house in the 1975 electoral register. The Bollens – the 1980 electoral register shows the house occupied by Andrew Hayward Bollen and his wife, Pamela. We understand that Andrew worked in the insurance business.